Mascus, the world’s leading online marketplace for used construction equipment, farming machinery, trucks, trailers and forklifts is now helping its customers present their stock on their Facebook company page. Facebook has become an important marketing channel for businesses over the years. They share updates, news, photos via their corporate page and keep customers and fans closer to the company’s life, to the services and products they provide. 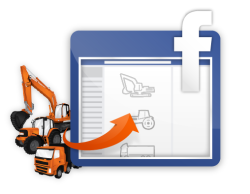 “Manufacturers, dealers, traders of heavy machinery and trucks are also embracing the possibilities that Facebook brings to their business. More and more have joined the social platform to present and share news about their company. Mascus has decided to help its customers build an even more interesting and attractive Facebook page with the launch of the web shop app.” explains Tim Scholte, Mascus CEO. The web shop app allows dealers to display their stock of used equipment and trucks directly on their Facebook company page without extra work! Easy installation, automatic transfer of your ads to your Facebook web shop! The installation of the web shop on your Facebook page is straightforward and can easily be performed by any page administrator. The web shop is automatically updated from Mascus, meaning that all the ads you are placing on Mascus are automatically redirected to your Facebook web shop as well. With this app, dealers offer their Facebook fans additional content, they also gain in visibility on the platform as people can share and like machines and trucks they have seen in the web shop. The first successful integration into an active Facebook business page was pioneered by Pfeifer Heavy Machinery.